The saline reject from RO units are evaporated in a seven stage Multiple Effect Evaporator supplied by Mojj Engg. Systems, Pune with four stages of falling film and 3 stages of forced circulation evaporation towers (calandrias). The fuel used for producing steam is firewood and biomass briquette. The salt-laden solid residue is separated out in a pusher centrifuge. The 65-70% permeate recovered from RO system and the 20-25% condensate recovered from evaporator are mixed together and distributed back to the tanneries for use in their manufacturing process through a recovered water conveyance system with three Over Head Tanks at different locations in the cluster. The salt-laden solid residue is stored in bags and a huge salt storage yard has been constructed for the purpose. Efforts to re-use the salt in preservation of hide / skins and purification system is underway. The Sludge from the Primary, Secondary and Reactivated clarifiers is dewatered in 5 Nos of mechanical filter presses or in the sludge drying beds. The back washing effluent from Sand filters is discharged back to the Receiving Sump and Back washing from Dual media filters, UF and RO is recycled back to the Secondary Effluent Collection Tank. The dried sludge is then disposed of to the Secure Land Fill System. 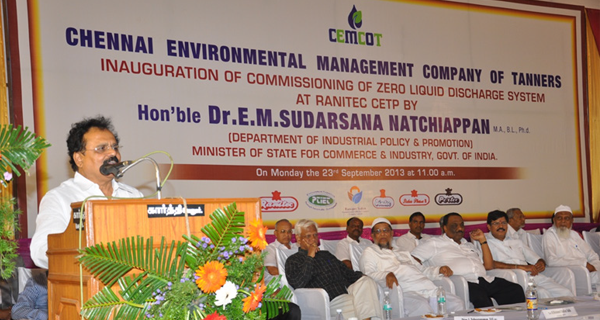 The CETP meets the Zero Liquid Discharge standards of Tamil Nadu Pollution Control Board (TNPCB), and the Flow meters are connected to the CARE AIR CENTRE for online monitoring by TNPCB at Chennai.